A documentary based on Joel Rosenberg's newest non-fiction book, "Inside the Revolution." Both the book and DVD trace the three major factors that are shaping the Muslim world today: Radicals, Reformers, and Revivalists. Viewers will not only come away with a better understanding of these three factions, but they will experience the revival taking place in this region through those who have come to realize that Jesus Christ is the only true hope. Features: Feature-length, high-definition video, 70-80 minutes in length. 90 minutes of in-depth interviews, including Iraqi General George Sada, Lt. General William "Jerry" Boykin (retired), former director of the CIA Porter Goss, and more! An exclusive inside look at how Muslims converting to Christianity are affecting Middle East governments. Filmed in Morocco, Israel, Iraq, Jordan and Washington D.C.
- Publisher :A documentary based on Joel Rosenberg's newest non-fiction book, Inside the Revolution. Both the book and DVD trace the three major factors that are shaping the Muslim world today: Radicals, Reformers, and Revivalists. Viewers will not only come away with a better understanding of these three factions, but they will experience the revival taking place in this region through those who have come to realize that Jesus Christ is the only true hope. Feature-length, high-definition video, 70-80 minutes in length. 90 minutes of in-depth interviews, including Iraqi General George Sada, Lt. General William ?Jerry? Boykin (retired), former director of the CIA Porter Goss, and more! An exclusive inside look at how Muslims converting to Christianity are affecting Middle East governments. 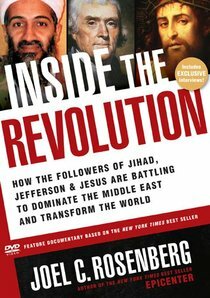 Filmed in Morocco, Israel, Iraq, Jordan and Washington D.C.
:A documentary based on Joel Rosenberg's newest non-fiction book, Inside the Revolution. Both the book and DVD trace the three major factors that are shaping the Muslim world today: Radicals, Reformers, and Revivalists. Viewers will not only come away with a better understanding of these three factions, but they will experience the revival taking place in this region through those who have come to realize that Jesus Christ is the only true hope.